Celebrating my birthday started on a very introspective note, and continued from there with some yoga and a dip in the rooftop pool. It was all done in contemplative silence, that sense of inner reflection still hanging there. But then it was time to let it go, time to get back out in the world. After all, I had stuff to do and a festival to attend. My older brother had contacted me earlier, we had agreed on a time when I’d be at the office and available for a Skype call. He’d be visiting our grandmother and would be calling from there, and got the idea to let her experience what modern technology can offer by displaying me on a screen while I’m on the other side of the globe. Which I thought was a lovely idea. So, eager to get everything set up so there wouldn’t be any hickups, I headed down to the tech park well in advance and set up the connection. At the same time Sajjad came by, carrying a small parcel. A present, for me? Cake! 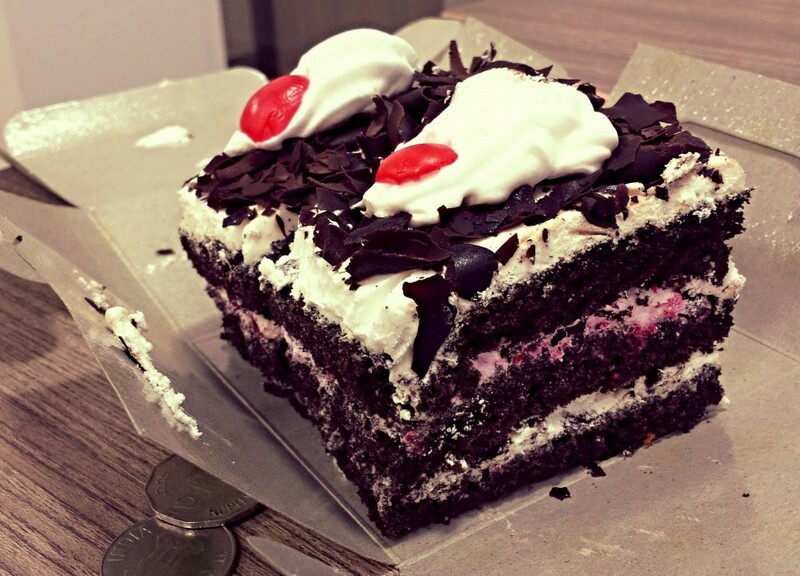 He had bought us cake, super nice! As we’ve established earlier, we can have quite an appetite. Despite the delicious cake we still had to get some lunch before heading out. So we head down to Amrita, one of the places that we have become regulars at by now. A while later, with a hunger satisfied, I made the call to Helsinki. I decided to take it outside and on my phone, so I could show some of the surroundings on the cam. Office interiors always look the same anyway, nothing interesting with that. It went quite smoothly, especially considering how bad the connection had been a couple of days earlier. It was heartwarming to see some familiar faces, my brother’s whole family was there as well as my uncle. And of course grandmother, her ever-sharp wits having no difficulty in comprehending what our modern gadgets are capable of. They even sung a birthday song for me. The clock was getting close to five so it was high time to get going to the festival. We checked the map, the distance was over 20 km, and with over 50 minutes travel time no wonder the auto rickshaw driver asked for 450 rupees. Not a problem – go go go, I said. 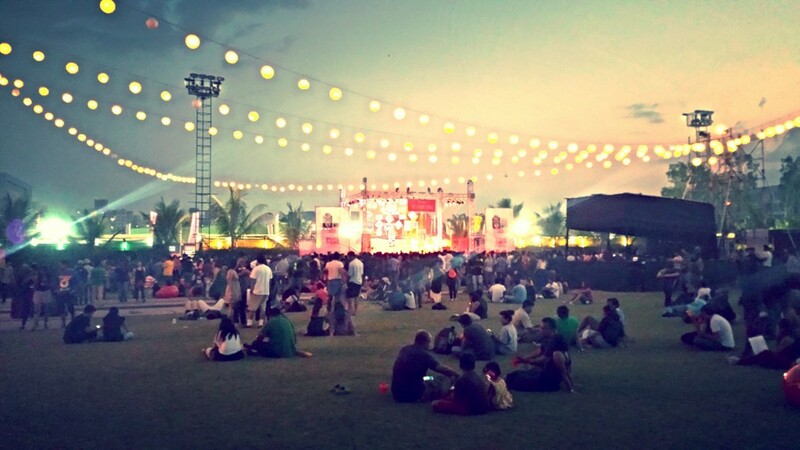 An endless stream of traffic, city blocks and chaotic intersections later we arrive at Laxmi Lawns, scene of the Bacardi NH7 Weekender festival, the steady thump of music beckoning us closer. Hundreds of meters before the box office the bass from the dubstep stage on the other side of the wall was deafening. Well inside, we planted ourselves on one of the central grassy areas and took in a somewhat more relaxed, jazzy atmosphere. Those who have been to the Flow Festival in Helsinki can relate; this festival was much like it, many artists across different genres coming together for a warmhearted weekend happening. The offering ranged from jazz to heavy, dubstep to indian music, folk to electronica. Mostly Indian bands but some international ones as well. It was invigorating to get out of Baner for a while and be in a setting which reminded more of what I experienced back home. Just hanging around, having a few drinks, enjoying good music and good food. It was also good to see that the locals can get really sloshed too if they want to. The bars had something called “Cuba Libre buckets”. You know why they called them that? Because they’re buckets filled with Cuba Libre. I’m talking at least one liter of mixed coke and rum in a sandbox variety red plastic bucket. It was crazy. They were so popular the bartenders had a hard time keeping up with even getting the buckets out of the wrappers they were packaged in. As the second day of the festival reached its end we hopped on one of the arranged small buses, to Koreagon Park. It wasn’t close to home, but it was closer. From there we managed to get one of the smoothest rickshaw drivers I’ve seen so far; swift and dodging through traffic like nobody’s business. Well back in Baner we tipped the guy a bit, picked up our bikes and headed back to the towers for some well-deserved rest. Not a bad day. Not bad at all.